A convention holds that craft reveres the repeatable, through which standards, techniques and a particular aesthetic or style may be maintained. The same repeatability, however, could lead to more spurious ends. It was the fate of Mingei wares in the wake of WWII which became clichéd, standardized, poor in quality and featured in high-end department stores in “Mingei corners” or, at the lower end, in tourist souvenirs from which evolved the euphemism “making Mingei.” It is not, however, the case that repeatability must obviate creativity as craft too, both modern and traditional, maintains a reverence for originality, though often within vaguely circumscribed bounds. A diary entry by the Japanese garden designer and tea connoisseur Mirei Shigemori (1896-1975) is telling. In 1958 he recorded that the modern Japanese/American sculptor Isamu Noguchi (1904-1988) had gifted him a tea kettle of his own design, which violated every concept of what a conventional kettle should be. 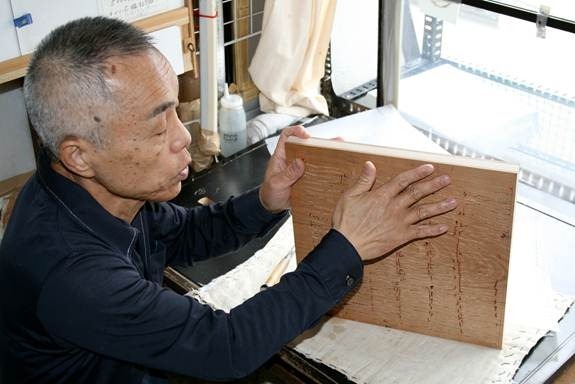 “Noguchi doesn’t understand what ‘new’ means for tea ceremony,” wrote Shigemori. In art, as not in tea ceremony, Noguchi’s design could freely follow the artist’s creative impulse without care for traditional tea values and aesthetic concepts. The creativity in tea wares, however, would find their genesis not in the liberation from rules or tradition, but freedom from the kind of arbitrary and impulsive behavior that resulted in Noguchi’s tea kettle. That kind of creativity, one tempered by the rules and traditions established by Sen no Rikyu (1521-91), continues in the present, as evident in 2009 at the National Museum of Ethnology, Osaka. Here the Senke Jusshoku (a term coined in the Taisho period, 1912-26, to denote ten designated craft producing families) were invited to the museum to survey their collection of over 260,000 objects from disparate countries and cultures, select a few the hand and eye took fancy to, and then create something of their own in line with their tea traditions. The Jusshoku, or “shokka” as they are referred to in tea circles, are the artisans who have served the major Kyoto tea schools for over 3-400 years. The family representatives were present in the Osaka exhibition in their 11th-17th generations. The 14th generation woodworker Komazawa Risai (b.1930) was intrigued by wooden wares from Kenya and, in particular, a colorful woven bread basket from Morocco. He followed its hexagonal form in his own creation of a mostly unadorned wooden sweets container. The 13th generation lacquer practitioner Nakamura Sotetsu (b.1965) settled on Iranian tiles decorated with geometrically arranged floral patterns, which she transferred into her own work, though further abstracted and more subdued. The point, at least in part, was that any number of exotic wares from far flung centuries could function as stimulus in the creative process. But the elements foreign to or unharmonious with the tea aesthetic must be removed or refined and tempered to practical uses for which the objects were destined. They also needed to observe an aesthetic humility, be free from affectation, and follow simple decoration that brought out the natural state of the materials used in construction. Working within the rule-governed expectations of tea tradition resulted in refined and tempered originality. 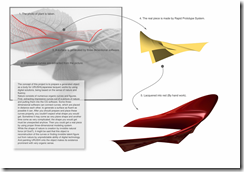 Throwing away all constraint of rules as in Noguchi’s kettle, resulted in nonsense. There is another way in which originality in craft may be traditionally broached in contrast to the production of a single masterpiece as understood in a fine art context. It is by following a practice concerned with unrepeatable effects in a repetitive context. Ken Kagajo (b.1974) brings together the traditional craft world with contemporary art. Initially he wanted to be a painter, though he entered the dyeing course at Osaka University of Arts because he thought he would succeed more easily in the entrance examination. Indeed, Kagajo takes a pictorial approach to his dye work that he conceives of as having affinities with nihonga (Japanese painting). 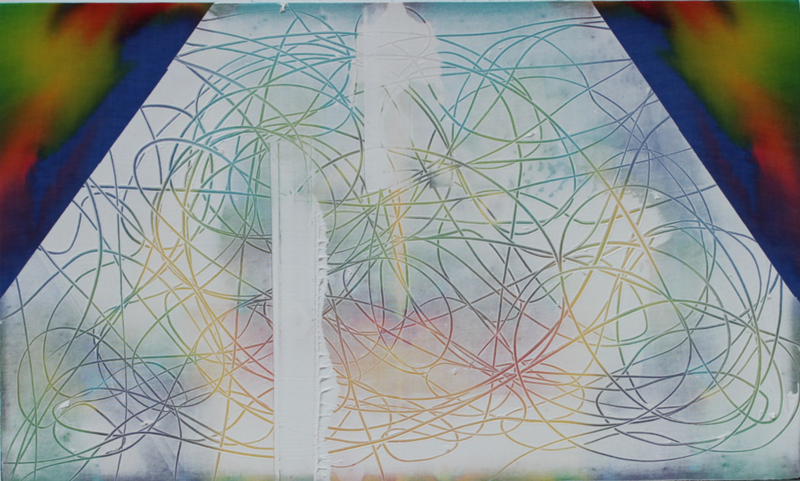 His work has also been compared to mid-20th century Abstract Expressionism, although the artist is careful to point out that his work is firmly engaged with the characteristics of dyes. He seeks to find an expression appropriate to his materials and medium which obtain in the blurring, penetration and run of color that result in subtle effects and ultimately unintended errors. Kagajo learnt the traditional paste resist dyeing technique while in university along with katazome (stencil dyeing), though he has taken to bleaching commercially produced patterned cloth in recent work in order to achieve gradated effects between bleached and unbleached areas. Many of his works are produced at home where he fixes fabric to the floor and then goes to work with his paste resist on fabric sheets often over a metre in length. Before beginning this process he finds it necessary to consult the weather forecast for five day stretches without rain as the dyeing and fixing from beginning to end takes about this long. Although Kagajo traces traditional continuities in his hybrid practice, some traditional purists have taken exception to Kagajo’s work and processes because they resist easy duplication and so seem to aspire too forcefully to originality. 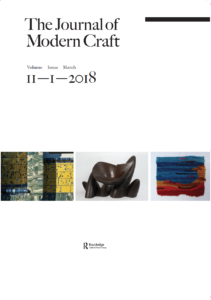 Perhaps such criticism is also representative of a tension between the traditional and the contemporary, though in Japan it is frequently the case that contemporary artists have traditional craft technical training due to the structure of the art university system. It seems, however, that easy duplication, as it went for many later Mingei products, can be synonymous with creative stagnation and in the end, mass production. In pursuing a concept of progressive tradition, Toki overturns long held ideas about lacquer. 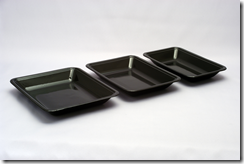 It is conventionally used to coat the kind of tableware objects kept and used indoors. The novelist Junichiro Tanizaki (1886-1965) wrote of lacquer in his eccentric aesthetic treatise, ‘In Praise of Shadows’ (1993), that darkness was indispensable to its beauty. 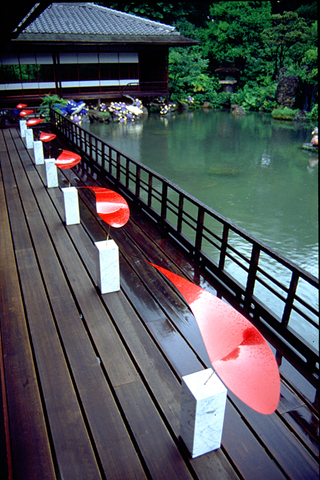 Toki, however, for the Kyoto Art Festival (1998), created curved lacquer sheets called ‘Soul is anxious for wing in the air’ that were elevated above the ground and arranged along a bridge that spanned a pond. The purpose of such a setting was to bring the craft out of the shadows so that lacquer’s brilliant color could be appreciated. It was also a mild riposte to objections about keeping lacquer out of direct sunlight due to the damage it causes the surface, dulling its sheen. 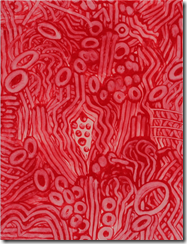 Toki’s work, too, chimed suggestively with his inspiration, form and material. 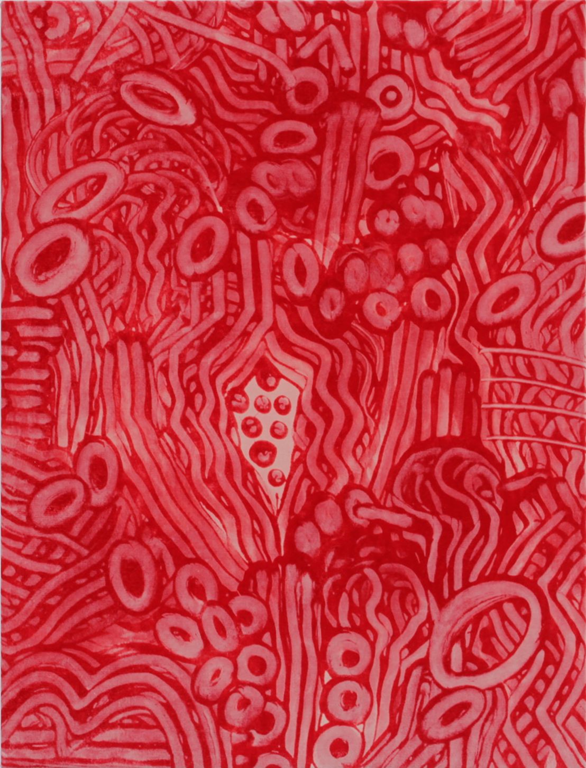 The lacquer sheets were inspired by the surface of water and their evident droplet shapes further conspired. Lacquer too is a liquid material that hardens by chemical reaction with moisture. It was perhaps fortuitous that the exhibition coincided with Japan’s rainy season. 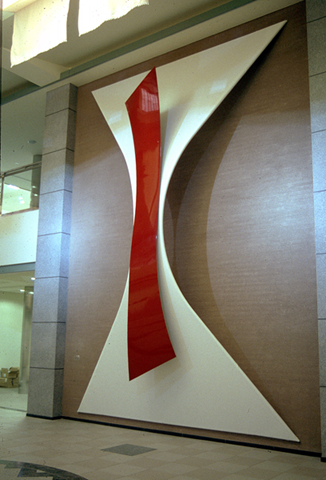 While previous work was intimate, works like ‘Form for Wish’ (1999) in the collection of Ayabe City, Kyoto Prefecture, assumed a monumental scale. 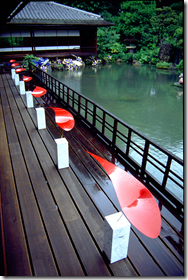 Once again Toki coated the abstract work with his trademark red lacquer, but used carbon fiber reinforced polymer (CFRP) to create the form. Such fiber is more often used for applications in the aerospace and automotive industries. It helps Toki achieve a thinner, stronger and lighter construction. ‘Form for Wish’ is approximately six meters high, a centimeter thick, but weighs merely seven kilograms. The uptake of the material seems like a shift away from tradition, but Toki notes that practically any surface can be covered in lacquer, and part of his attraction to the space-age material is that there are no preconceptions of how the material may be put to use. The form further reengages traditional lacquer craft ideas through an attention to the molding of the surface. 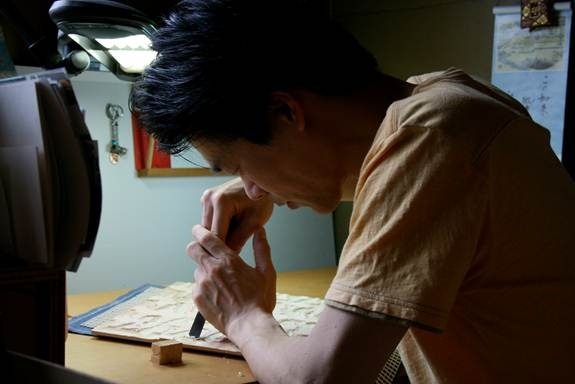 Since 2002 Toki has conducted his artistic research in computer assisted design (CAD) and rapid prototyping to search out the implications of new technology for craft in his hybrid digital/hand practice. Toki extracted curves based upon the natural forms of leaves and entered these into computer software where he created a seamless surface between the lines. 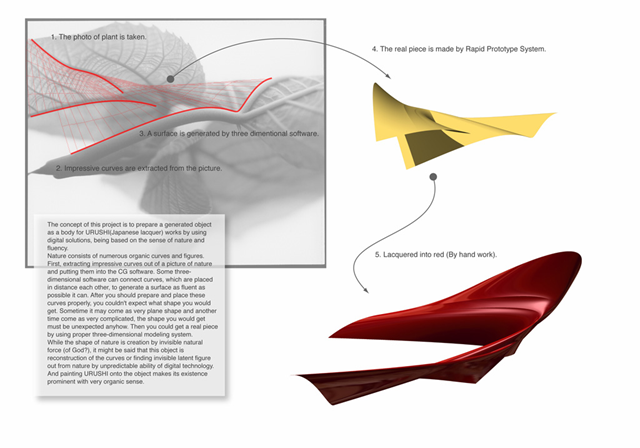 He then used the automatic construction process of rapid prototyping which converts a design into a solid object through the build up of layers. These layers are sliced in the CAD model and that data directs a laser on to the surface of a tank of photosensitive resin. Where the laser strikes, the resin solidifies. The layers accrete into a final form which is then coated in lacquer by Toki. The point of these experiments, which Toki calls ‘Latency,’ was to arrive at forms mechanically created though finished by hand. These were based on nature, though not found in it. 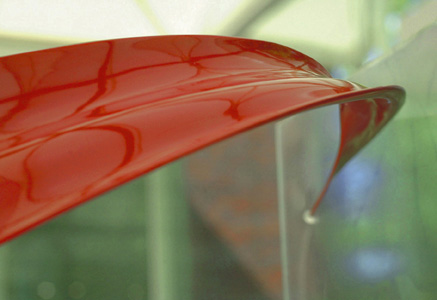 The result was something that also retained connection to traditional lacquer ideas of flowing curvature, lightness, organicity and a certain cleanliness. Further reference to mechanical construction arrived in a series of individually produced and hand finished copies exhibited at Kyoto’s Gallery Gallery in 2009. These works took their formal cue from the mass produced polystyrene trays found in supermarkets for food packaging and display. Toki’s trays are again homage to mechanical reproduction and traditional craft. 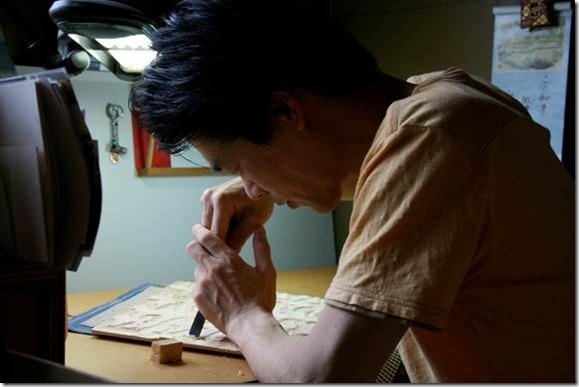 He uses his computer to generate an object as a body for lacquer and he uses his superlative lacquer coating skills to create objects which are almost perceptually indistinguishable from the visual and formal characteristics they ape. Indeed, Toki compares his lacquer application to both the skill of the painter, and his minute and precise hand movements to the precision of digital measures. Traditional lacquer production fell into decline in 19th and 20th centuries as it could not compete with the mechanical production methods that turned out copious quantities of inexpensive products for a receptive and burgeoning consumer class. 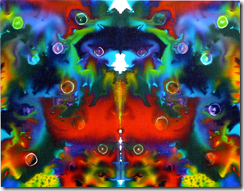 Toki, however, inverses that trend, utilizing technology to produce individual mechanically produced works which straddle a virtual-handcraft divide. 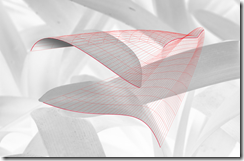 Such an inversion allows Toki to individualize the reproducible. Matthew Larking is a lecturer at Kyoto Notre Dame University, Kyoto, Japan, and has written as an art critic for The Japan Times since 2002.